Potato skins aren’t just traditional bar food. 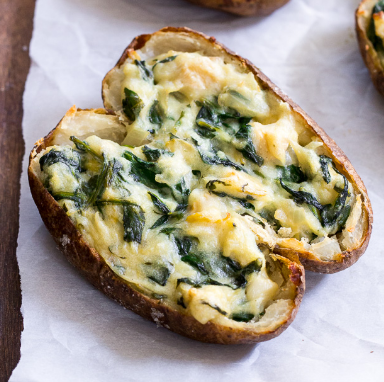 These creamy baked potato skins are a delicious and healthier alternative. Preheat oven to 390 degrees F. Scoop out flesh of potatoes, leaving about 1/4 of potato flesh in each potato. Place potato halves on Pam-sprayed baking sheet. Bake until lightly browned, about 15 minutes. During this time, combine remaining ingredients and mix until blended. When potatoes are browned, remove from oven and divide spinach mixture evenly into each half. Bake until warmed through, about 5 minutes.